This guest post comes from Miss Briony Marks who has guest posted here before with her work in maths. Today it is her story of working with Year 7 students in our Preparatory School, introducing them to the basics of coding. You can see the original post here. One of my goals for this year was to learn something (anything!) about the world of coding and how teaching coding in schools can benefit students. January came and I started with trepidation and a sense of awe as I scoured the Internet looking for ideas and where to begin. I was utterly overwhelmed by the amount of information available. I want to share this journey with you in the hope that it will help others along their way! 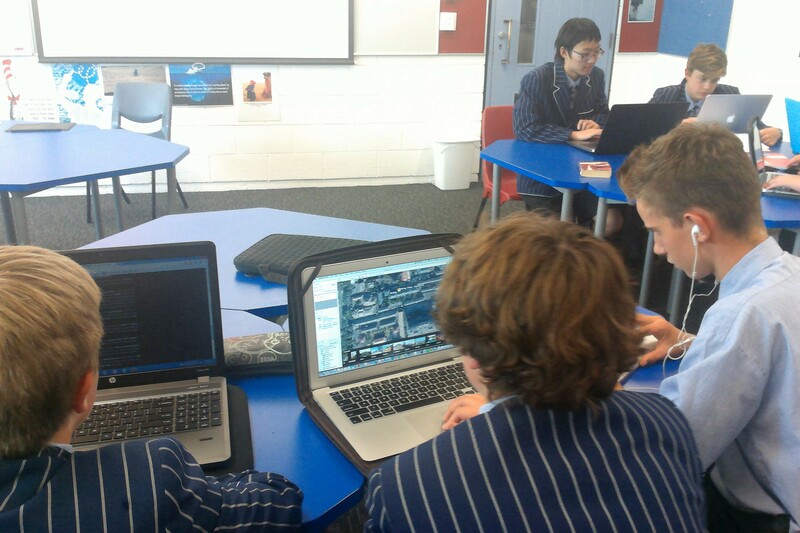 I’ve been working with a Year 7 class who had no prior experience with coding. I’m hoping to survey and interview them about their experiences towards the end of this term. I began with the students in the same place that I started as a teacher; looking for information on the benefits of coding and why we should be encouraging students to learn how to code. I found myself reading guest articles by Chris Betcher (@betchaboy) on Splash ABC, “More than a game; why coding will help kids for life” was just what I was looking for. 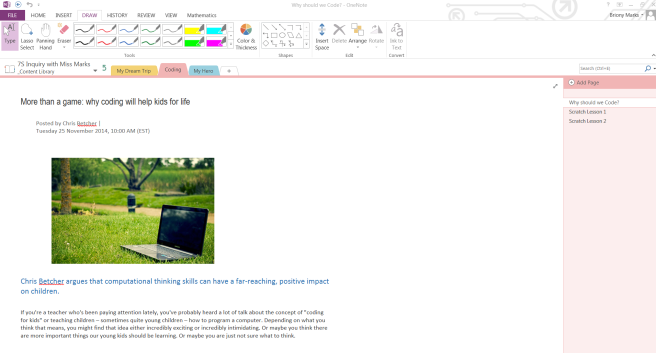 I copied the article onto our OneNote Content Library and asked students to read and highlight key information. The article was in our content library ready for students to copy across and annotate. 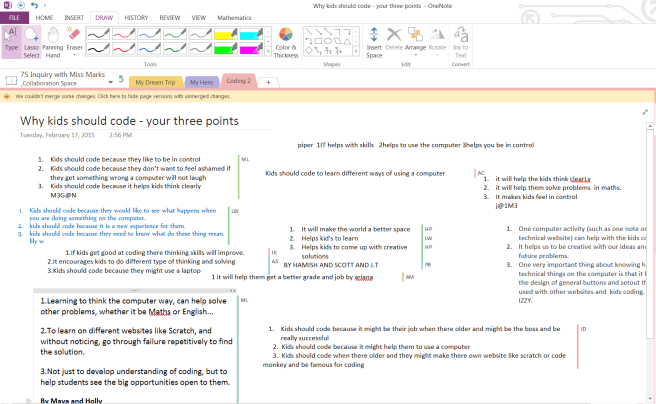 Students then worked in pairs to discuss the article, ultimately posting three reasons why we should code onto our Collaboration Space, this was a great exercise in using OneNote to work collaboratively and to share ideas as well as encouraging students to see the benefits in coding. Kids should code because they would like to see what happens when you are doing something on the computer. kids should code because it is a new experience for them. kids should code because they need to know what do when they don’t know what to do. Learning to think the computer way can help solve other problems, whether it be Maths or English. To learn on different websites like Scratch, and without noticing, go through failure repetitively to find the solution. Not just to develop understanding of coding, but to help students see the big opportunities open to them. Other students identified being able to get jobs in the IT Industry as a key factor, being able to write your own apps, create websites or blogs. Despite this shared knowledge the students were still asking me “what is code?” and “what does it mean?”. They had been told what the benefits of coding were without knowing what it really was (other than it was to do with computers!). To tackle this question I used a PE lesson. I was still a little wary of where to begin with computers so was grateful for the opportunity to delay the inevitable! I wanted to show them that coding was essentially a series of very specific commands so we set up obstacle courses. Armed with stacks of cones and hurdles and a box full of blindfolds we constructed two obstacle courses. Students had to come up with a list of commands to navigate a blindfolded partner through the maze. The blindfolded partner could not think or act for themselves. They had to be told exactly what to do. The results were great – students were highly engaged and were frustrated when their sequence of commands weren’t interpreted as hoped! We had started to test and re-write our code and there wasn’t a computer in sight. Even now as we make our projects in Scratch I remind the students of this experience and how important it is to have an eye on a goal and to write clear, specific instructions as to how to get there. A great post from Miss Marks and we will certainly post updates about how the students are getting on with their programming challenge. Last week I was invited into the Year 10 English class of Ms Tam Yuill Proctor to observe her students creating virtual tours within Google Earth of the key settings in the film Karate Kid they were studying. Creating these tours is something I’ve blogged about before, however this is one of the first times I’ve seen it being used in English to specifically map out the locations of a film or novel. I sat down today with Ms Yuill Proctor to learn more about the process and find out what worked well and what could be improved on for next time. The goal of this exercise was very simple: for students to arrange themselves into groups of three, of which one student must have knowledge of how to use Google Earth (and ideally, how to create tours in them). Fortunately, many of these students had done a similar exercise in Religious Education the previous year and were able to draw on prior knowledge to help. Once they had identified these locations, they were to record a guided tour through Google Earth, highlighting their rationale for their choice of locations and then share it with the class via the collaboration section of the class OneNote Notebook. The students were only given 1.5 lessons to complete this task and it was interesting to observe the efficiencies that various groups gained through their approach to managing the task requirements. A script writer – who would narrate the voiceover with relevant information for each location. Whilst many groups chose to all use their laptops at the same time, others preferred to gather around a single device and share their ideas more directly with each other. 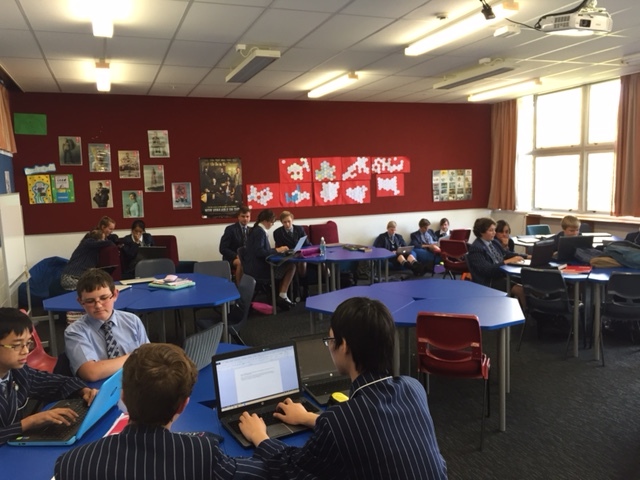 Due to the short time allowed for this activity, Ms Yuill Proctor was quite explicit in encouraging students to manage themselves when it came to sharing the workload and ensuring all tasks were completed (Key Competencies – Managing Self) Amongst the students it was decided that one would need to allocate some homework time to meet the deadline. One student setup a new section in the class collaboration area in OneNote and then each group created a sub-page where they shared their tour. This did create some problems as students had often found third party recording tools to make their tours in, resulting in some file formats that did not work on all devices. Reflecting on this Ms Yuill Proctor and I agreed that having a student submit their work via a YouTube link or Office Mix recording would probably be best in future. Despite these problems, it provided an opportunity for problem solving amongst the groups in terms of how best to record the tour, with many finding different solutions to this. Interestingly, the boys that are into gaming on their devices tended to be quicker at finding solutions in this area, again perhaps based on their prior knowledge they possessed. 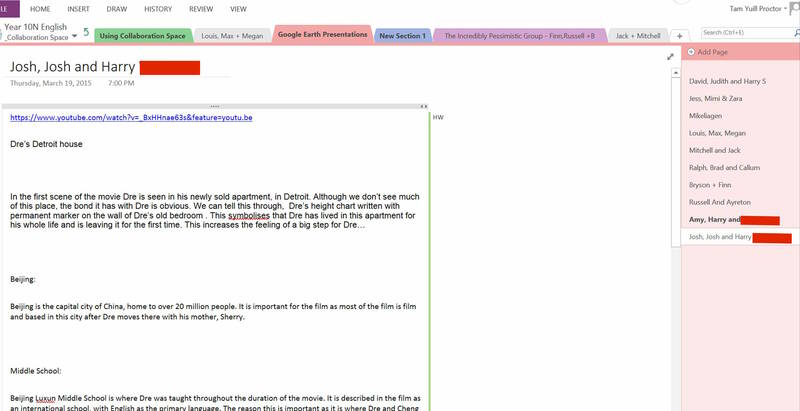 The students now have a visual picture of the settings and locations of the film – this is easier for them to remember than simply writing or typing the locations as a list in their NoteBooks. However, she was quick to point out that she continually asks herself “do students need to be using technology for this particular task, or can they do it in a different way?” She is conscious that often our students in Years 9 and 10 are using their laptops for most lessons each day, and so will often use more practical activities (such as using scissors to cut out paper SOLO hexagons) . The final step for the students is to individually choose a scene they feel is important and to write a paragraph on that location, linking it back to the overall themes of the film itself. It’s remarkable that students were able to come up with these tours in under two lessons of class time and reflects their growing competencies with their devices (having used them in many classes throughout 2014). It also highlights how an engaging activity can hook students in and set them for strong involvement for the rest of the film study.